Trencin is one of the biggest cities in Slovakia. Lying on the river Vah, with its old castle, Trencin is definitely one of Slovakia's not-to-miss places. It is located halfway between Trnava and Zilina, and only a few kilometres from the border with the Czech Republic. Going by car, bus or train it makes a good day trip from Bratislava, as the time you need to get there is short. The Old town is mainly centered around the market place, where you will find the plague monument, churches, a well (with a statue climbing out of it), the city gate, and the synagogue, which is now in use as an art forum. From the market you can climb the Parish stairs to the roman church of the birth of the virgin Mary. from which you have a nice view over the town. From there it is just a short climb to the entry of the Castle. Trencin Castle is towering over the town. Its highest point is the main tower which towers 150 metres above the town. The castle has a rich history and can be visited with a guided tour. (one small tour and a large tour are available.) The small tour includes the main features, including some time at the viewing platform on the tower. The larger tour include the interesting although not impressive, archaeological and art collection (which is in need of some restorations). The castle is opened daily apart from New Year's day, Christmas Eve and Christmas Day from 9:00am until 3:30pm in winter, 4:30pm in April and October, and 5:30pm in the summer months. The tours are in Slovak, but English explanation on paper is available. By train you can travel from Bratislava to Trencin in around an hour and a half. Trencin is one of the stops on the line that starts in Bratislava and runs across the country towards Kosice in the east. The train station (and bus station), is located about 400 metres from the center of town, on the other side of the M.R. Stefanika parque. For information and timetables check the website of Railways of the Slovak Republic. Trencin lies on the D1 motorway coming from Bratislava, and which carries onwards to Zilina. From Bratislava it takes around an hour to reach the town. Regional route 61 also connects from Bratislava, and follows the flow of the Vah. Bus lines run across the town, which is easy when you happen to have a hotel/hostel outside of the city centre. All the major sites are located within a short distance of each other, therefor Trencin is best explored on foot. 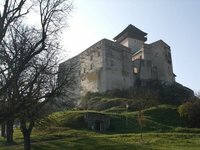 We have a comprehensive list of accommodation in Trencin searchable right here on Travellerspoint. You can use our map to quickly compare budget, mid-range or top of the range accommodation in Trencin and areas nearby. This is version 26. Last edited at 3:15 on Aug 2, 17 by sleepBot. 1 article links to this page.